“Maybe that’s because it takes a lifetime learning what’s important enough to talk about or record,” I suggested. She smiled for the first time, “I had hoped you’d say that.” She released the envelop and quietly left. The editorial could wait, I decided. My little piques and boiling points weren’t hard to rekindle, and I always ended by tempering the editorials that reflected them, anyway. So, I began reading Matty’s work. As noted, it wasn’t voluminous by any means, and by four o’clock that afternoon, I finished it. But it certainly wasn’t finished with me! 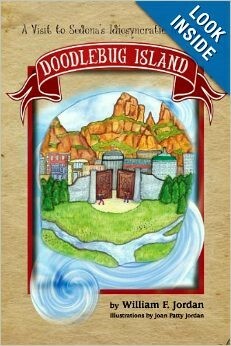 Now, I’ve known Mattie ever since she moved to Doodlebug Island and took a job in the library a few years ago. Like other Islanders, I found her to be gregarious and friendly, patient, quick-witted, and immensely helpful. Everything about her spoke to a joyous optimism that seemed to spring from a concern for others, for she seldom if ever alluded to her own history or concerns. So, it was a shock to read about her personal tragedies and sadness that burdened her life before she came to live among us. “I will not dwell on my personal griefs,” she wrote, “for everyone experiences his own. Suffice it to say that I lost my father in WWII, my cherished husband in the Korean War, and my darling son and only child in Afghanistan. Between wars, mother, whom I lost to the ravages of melancholy, and I knew want. This summation, so simply and beautifully expressed, appeared as a foreword, and was the theme of her work. The essays, stories, biographies, and poems that followed were equally well constructed, sensitively written, and thoughtful. Mattie was surprised when I popped into the library next day with all the books and other items I’d borrowed, and with a check sizable enough to cover any overdue charges with enough left over to express a suitable apology. I handed her the manuscript but retained hold of it just as she had. Tears welled up in her eyes. “Thank you,” she whispered and nodded almost imperceptibly. Neither of us could say more.